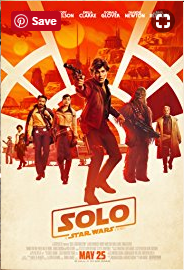 The “Hans Solo” story is Ok, but it’s not the usual Star Wars blockbuster we have come to expect. The story starts off slowly and drags. It takes over 50 minutes for things to heat up and get interesting. Once the events get going it’s an enjoyable movie. There are plenty of crazy stunts, lots of action and beautiful cinematography. Please do not expect the usual Star Wars Blockbuster. You will be disappointed. This is a Ron Howard production. It is pretty good.